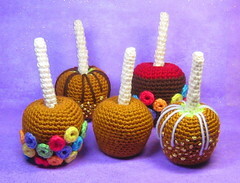 Something to crochet for halloween, or use as a fancy pin cushion. I enjoyed putting the decorations, especially the "loopy cereals." I wanted to use a real stick, but I thought if a child would like to play with these, he or she might get poked in the eye, so I just designed it with a crocheted "stick." ox@ntlworld.comthese are lovely and i LOVE your cakes you have been making.